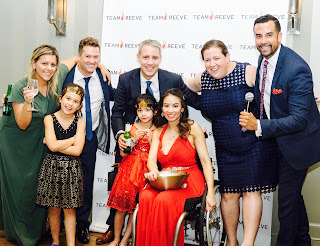 The Race for a Cure Gala to benefit the Christopher & Dana Reeve Foundation took place on June 17, 2017 in Westchester, NY. The idea to hold the event first ignited when my husband, Daniel, decided to take on the 2017 NYC Marathon with his friend, Michael, under “Team Reeve”. 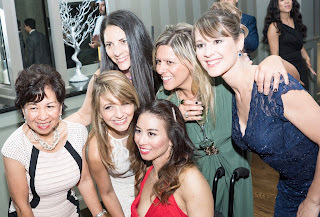 We saw this as a great opportunity to contribute to the Foundation since they provided us with so many resources when I became paralyzed, 11 years ago. My friend, Karina (Michael’s wife), and I immediately took on the exciting mission to plan a fundraiser for the very first time! We knew we wanted to have a guest speaker with a spinal cord injury/condition to share their story at our event. Little did I know, it would be more challenging than I thought to find a speaker. Most of the admirable people that I had in mind, were unavailable or had expenses that we couldn’t cover in our event budget. As days and weeks passed of planning the event, we still had no speaker. Wendy Crawford, a co-founder of The Raw Beauty Project and mobileWOMEN.org, was one of our potential speakers, but was also unavailable. Wendy then suggested that I should be the one to think about speaking. I never really saw myself as a speaker. I’ve always been more of a writer since its obviously so much easier to type words out, as opposed to actually saying them. Karina also asked me how I felt about speaking. To tell you the truth, I was avoiding the situation altogether. I told her, "I'm just going to thank everyone and wish everyone a great night!" There I was, trying to make excuses to get out of doing a speech. Karina looked at me and said, "Thank everyone and then WHAT?! Don't you want people to go away with a lesson they’ve learned from your story?" She did have a point. As the event planning continued, I spoke to all my closest friends, my mom, everyone else and their mother. They all consistently told me the same thing: the one person they’d like to hear from is me. Basically, all the signs from the universe kept pointing its fingers at me to speak at this event. Then I started to think, maybe I was meant to speak and send out an important message. So I decided to accept the challenge. I asked myself what I was dreading and what scared me so much about speaking at my own event. Since most of the guests would be my friends, family and people from my community, it was actually kind of silly to be nervous. 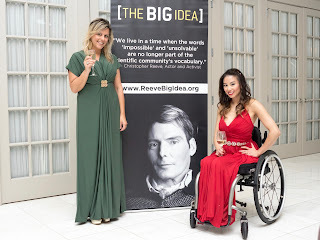 I finally realized what the big barrier was - I usually don’t tell my story of how I became permanently wheelchair-dependent on a regular basis. I never recount each event of October 6, 2006 verbally, let alone say it aloud through a microphone, in a hall, in front of 70 people. On that fateful day, I was home, alone, doing laundry when I started to feel sick, weak and feverish. Then a strong pain developed in my lower back and I started to lose sensation in my legs. I was rushed to the hospital and was diagnosed with Transverse Myelitis - an inflammation in the spinal cord that caused nerve damage. Within a few hours, I was completely paralyzed from the waist down. Of course, today, I am way past the grieving phase, past the traumatized phase and past the shock. Throughout the years, I have processed it, dealt with it and evaluated it. You can say, I’m officially emotionally healed. However, what I feared the most was my own reaction when I would hear myself say the words. Would I break down and cry? Would I laugh out loud hysterically nonstop? Or would I sit there frozen and not be able to get the words out? Or maybe I would just hyperventilate and have high blood pressure? I had no idea. Like most people, it was the unknown that scared me so much. In order for this speech to be a success, I had a lot of work to do. Lord knows I'm not a stand up comedian, nor am I a motivational preacher, nor a good improviser. I wanted to be 110 percent prepared and wasn't going to take any chances. First things first, I had to rewire my brain's way of thinking. Making the decision in my mind to "slay" this speech helped me set a clear goal for myself. By "slaying” it, I meant not being afraid of the unknown, being present and being able to talk freely to everyone. The next thing I had to do, was stop talking about how nervous I was and start saying more positive words such as, "I'm really excited about speaking" and "I'm looking forward to sharing my story." Its pretty amazing how you start to eventually believe the words that come out of your mouth. Of course, I definitely wasn’t too proud to ask for help. I immediately turned to people that were veterans of public speaking. One of them was Wendy Crawford. She gave me advice on how I can make the speech more personal by talking about my family. Wendy also recommended that I be as honest as possible, since people can really relate to pure honesty. The other person whom I turned to was my good friend, Carolina, who has done a total of 30 public speeches. She gave me some really helpful tips that ended up having quite an impact on how my speech was delivered. Carolina advised me to look at my audience members in the eye and take deep, long breaths before I even speak those first words. She also reassured me that it was OK to "just let go" emotionally and not be afraid to show my vulnerability. One common word of advice that I got from everyone, was to "speak from the heart." What I discovered to be a powerful tool was visualization. I continually visualized myself giving a speech with my voice loud, clear and assured. The results from specific visualizations were quite miraculous. It made me feel more in control and better equipped. The evening of Race for a Cure Gala finally arrived. To my surprise, I was incredibly calm, present and enjoying every minute of the event. 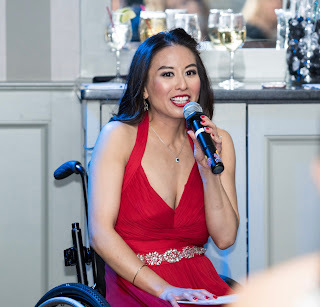 I was truly looking forward to sharing my story with everyone and couldn’t wait to do my speech! The running theme of the event was "Superheroes,” since people with disabilities should be seen strong survivors, or "Superheroes." It only made sense for the content of my speech to be centered on a quote by Christopher Reeve. 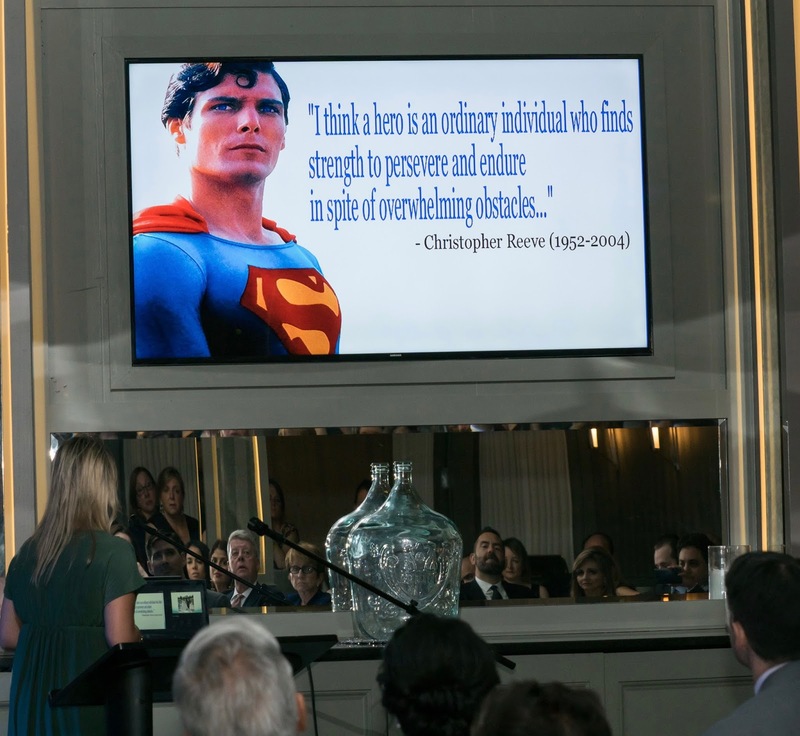 He once said, “The definition of a superhero is an ordinary individual who finds the strength to endure and persevere in spite of overwhelming obstacles." I wanted to convey a single, simple message and for people to be able to relate my story to their own lives. Everyone has gone through something awful in life. It is possible to find strength to get through a traumatic experience or a difficult time period and overcome adversity. Rest assured, I didn’t hyperventilate or do any of the overreactions listed above. It was actually a big relief to finally open up, let go and let everyone in. The experience of facing my fear was so empowering. I realize now that finding the courage to do something you’re scared of doesn’t mean you stop being scared. It means you’re still terrified, but you decide to jump anyway not knowing what will happen. While I was speaking, I felt extremely grateful to be given an opportunity to motivate and inspire others. My friend, Carolina, posted my speech live on Facebook that evening. Her neighbor, who was going through a tough divorce, happened to watch it and said my speech was just what she needed to hear at that moment. My niece, Katherine, who couldn’t make the event that night, watched my speech on YouTube a few days later and said it made her day. If I encouraged someone to stay strong during a difficult moment in his/her life or if I brightened someone’s day, I know it was the right decision to speak. I know I’ve given the message I was meant to send!